1.8 (One Point Eight) hangs above us, a monumental floating form. In Mexico City its presence fills the space of the Center for Contemporary Culture with vibrant color and gentle movement. Composed of layers of technical fibers, braided and knotted together, the form of 1.8 responds to the light streaming above it and the breeze through it, while at night pulsing alive with projected colored light. This twin effect, that of the unplanned weather and programmed colored light push against each other, resulting in an ever changing choreography. The content of the sculpture - like its movements, is open ended, allowed to emerge within each person. Every viewer is encouraged to freely form associations, and create their independent interpretation of the work. 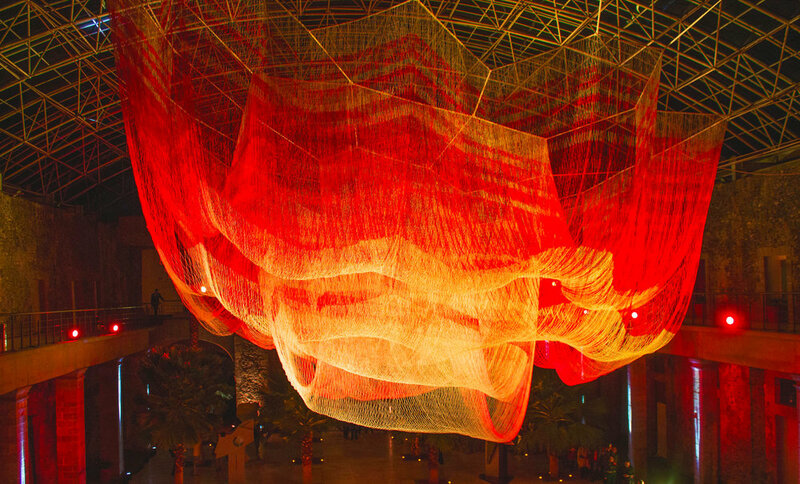 A physical manifestation of interconnectedness, the whole of the net sculpture responds to the movement of any individual part. This interconnection reveals a dramatic contrast at play within the sculpture - that of the seemingly delicate fibers and tremendous scale. The contrast beguiles and engages the viewer, inviting a moment of contemplation amid the bustle and commotion of daily life. Its title, 1.8 (One Point Eight) refers to the length of time in microseconds that the earth’s day was shortened as a result of a single physical event (in this case, data sets derived from the 2011 earthquake and tsunami that emanated from Japan). It is constructed from fibers 15 times stronger than steel by weight, and custom color blends that Echelman combines with light to create the dynamic final sculpture.